Do you enjoy digital movies by steaming them from Neflix, Vudu, Popcornflix, Hulu, Amazon Prime, HBO or buying them from iTunes, Google Play store or local DVD stores? If your answer is the streaming websites, which charge you only a few dollars every month to stream unlimited movies online, you may find that most of the hot titles took a rather long time to be available there. Sometimes a few months and sometimes longer than 1 year. One the other hand, if you choose to purchase the videos from iTunes or other stores, in theory you can find any titles that are coming or opening on the theatre. iTunes is the largest digital media store in the world with movies, TV shows, audiobooks, iBooks. The only caveat is that you will spend a lot of more money. So is there a way to buy iTunes movies at a lower price? Yep, absolutely. Please just pay attention to these top two ways of getting best iTunes deals. iTunes constantly offers different kinds of deals such as the $5 movie deals of new year celebration, $8 for the Oscar nominated videos, $10 to get the 4K HDR recent hits, $15 for bundles and some rent movies at only 99 cents. But iTunes doesn't seem to make it easy to track these deals obviously. In most of the cases, the movie I want are not on promotion and it takes me a large amount of time to keep checking repeatedly. 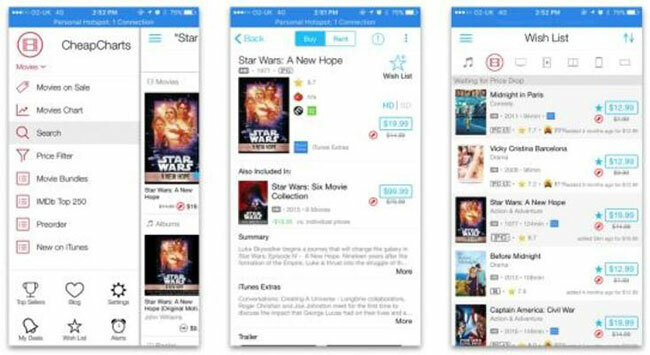 Fortunately, I found many websites such as CheapCharts, Blu-Ray, itmsMovieDeals accumulate the promotion info of movies from iTunes, Amazon and they are all great iTunes movie sale trackers. Among them, CheapCharts is the best one. It not only comes with the desktop websites, but also offers mobile apps for iPhone, iPad and Android phones. 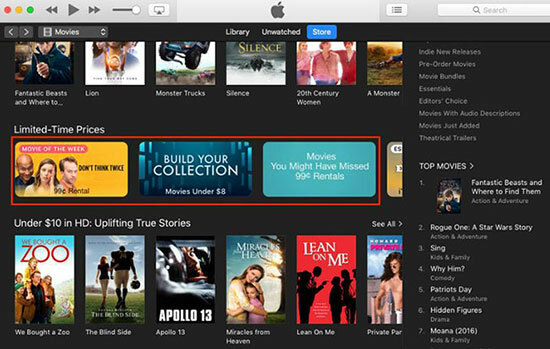 It can help us to learn all iTunes movie deals at a glance and save a fortunate on buying the movies, TV shows we really like. Step 1. Download and install the CheapCharts app from the iOS store or Google Play store. Step 2. Launch the app and login with your account and password, you will see the main screen of it. Step 3. Tap on the hamburger icon from the upper left corner > Tap the category you want > Tap "Search" button. Step 4. Enter a title of the movie you wish to get and then tap the star button "Wish List". Step 5. Whenever the movie is on sale, it will push you a notification. With the CheapCharts app, it will save tons of money if you buy many movies. However, what if the movie you like are never on the promotion list? Can you still buy it at a cheap price? To answer these questions, let's learn the prices of the iTunes movies first. You can either buy or rent iTunes movies. For the iTunes purchases, it usually costs $10~$20 or more. After purchasing, you can enjoy them anytime. For iTunes rentals, it is at a much lower price usually 50% lower than the price of the iTunes purchases. The disadvantage is that you need to watch it within 30 days. And it will be missing in 48 hours after starting due to the FairPlay DRM protection. Now you may have already got the trick I mean. You can rent the iTunes videos at a low price and remove DRM encryption from them to keep them forever just as if you have purchased them. 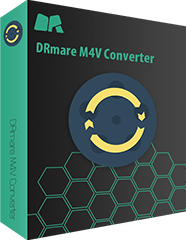 You just need a lightweight tool DRmare iTunes DRM Video Converter for Mac which is easily to convert iTunes rentals to purchases within a few clicks. What is more important is that it is totally legal as long as you use it for personal. Now let me show you how to convert iTunes rentals to MP4 for keeping forever. You can buy and download the iTunes rental movies on your iTunes first and then you can drag & drop them from the iTunes library to the DRmare software main screen. 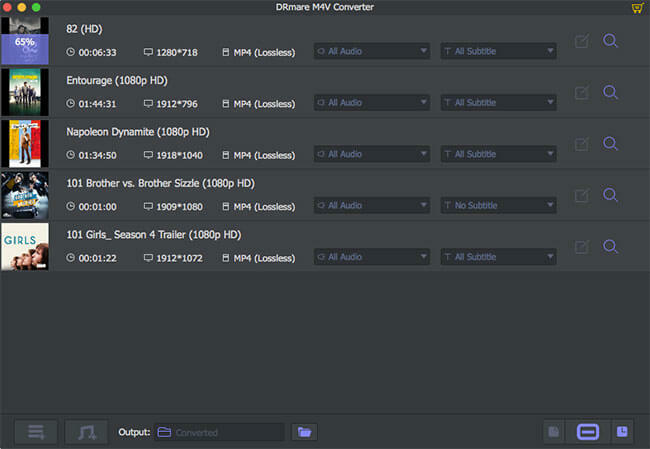 You can change an output format you like such as MP4, M4V, AVI, WMV, MKV, MOV, MPG. 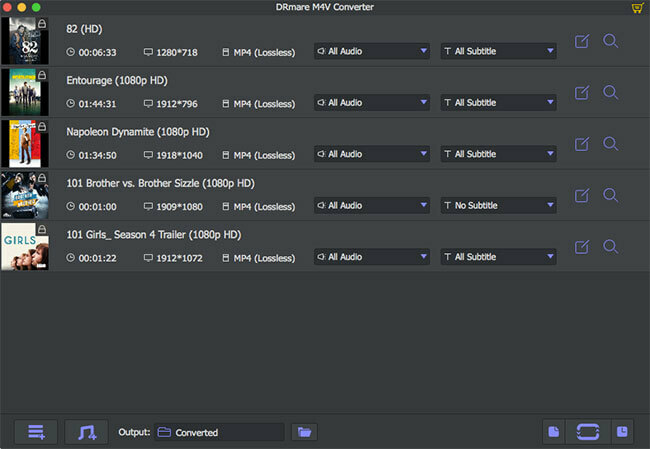 Besides you can edit the video parameters like speed, volume, watermark, subtitle, audio effect and so on. 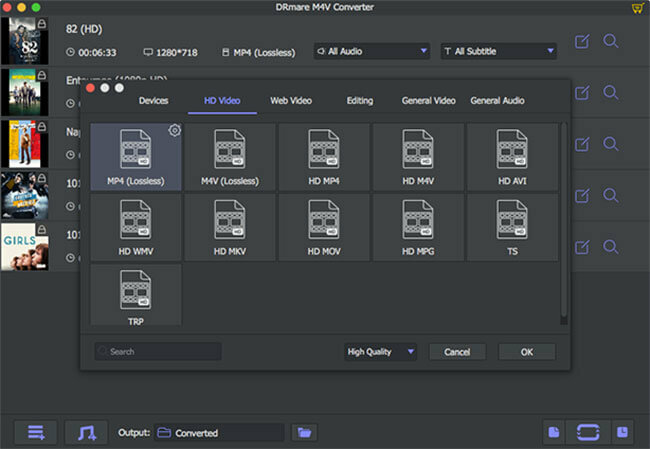 At last, you can select an output folder and then click "Convert" button from the bottom right, your iTunes rentals will be converted to common videos which you own. The largest advantage of iTunes compared to other streaming movie sources is that it offers a largest movie library including all the up to date titles. Hence, it is the first choice of many Apple fans. If you have a long list of movies you plan to watch, you should try the first method to add them to the wish list on your CheapCharts app. You will receive the iTunes deals info to buy the movie at a cheap price. But if you are hurry to get a movie which is not on promotion, you can also just rental it at a low price and use the DRmare software to unlock it to get the best out of it. Sharing is a virtue. Do you know any other ways to save money on buying iTunes media files? If so, please do not hesitate share the tips below.